Two years ago this month, Huss Brewing opened the doors to its laid-back taproom nestled in the corner of Uptown Plaza, 100 E. Camelback Road. Owners Jeff and Leah Huss wanted it to be a spot where Central Phoenix neighbors could chill out with friends or enjoy a solo bit of reading and relaxation while downing a pint of Huss’s signature brews and a savory snack. You could say beer is in their blood. 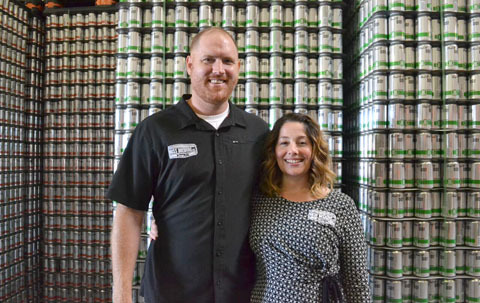 Husband-and-wife team Jeff and Leah Huss, owners of Huss Brewing Co., have a combined 27 years of experience in the brewing industry. Their popular Huss Taproom in the Uptown Plaza celebrates its second anniversary this month (submitted photo). The couple has 27 years of combined experience in the brewing industry. Leah co-owned and operated Papago Brewing in Scottsdale for 14 years. Jeff was head brewer for BJ’s Brewing in Chandler for seven years before they decided to strike out on their own. They opened Huss Brewing Co. in Tempe in August 2013, with a 30-barrel brewing system and a small tasting room. Jeff was head-brewer with Leah running business operations. Chip Mulala, known as the brewery’s “minister of craft beer,” was brought on board as director of sales, marketing and national accounts. In 2016 Huss acquired the Papago Brewing Company in Scottsdale, and today Huss is the third-largest brewer in the state, tripling its brewery space and expanding the lineup of varieties. That growth continued with the Uptown Plaza taproom. And it’s taking another step with Arizona Light, the state’s newest light craft beer—but more about that in a minute. The taproom’s laid-back vibe and fine-tuned bar food menu, served in an open, airy setting with ample patio seating and friendly service, has proved to be a great fit within Uptown Plaza. Great food has to start with great ingredients, and that’s been a focus at the taproom. “Mike’s been really instrumental working with our local providers, like Schreiner’s Sausage,” Malala says. “Our sausage boards have been a huge hit.” The boards feature Cajun andouille, smoked bratwurst, Portuguese linguica and cheddar bratwurst, with sauerkraut, cornichons, giant pretzels, pickled cabbage, beer cheese and mustard in various combinations. There also is a selection of sliders with green chile pork, roast beef or caprese and flatbread boards. Now about that light beer, which hit the market in late March. “As craft brewers, we’ve always been conditioned to think outside the box, to try things that are different,” Mulala says. “We wanted to make a lager that is light in calories—110 calories—that still has flavor and depth. The light lager is the latest crowd-sourced brew from Huss, following on CenPho, a local collaboration using donated home-grown citrus to make an IPA. That brew has already sold out. Meanwhile, the taproom serves an extensive selection of other Huss brews, including Scottsdale Blonde (which won a 2016 U.S. Open Medal), Orange Blossom Wheat Ale, Koffee Kölsch, Husstler Milk Stout (Bronze medal winner at the Great American Beer Fest in the Sweet Stout Category), Magic in the Ivy Pale Ale, Copper State IPA and their newest offering, Arizona Light. Occasional varieties include raspberry rose sour, juicy peach, kumquat kölsch and raspberry milk stout. The Huss Brewing Co. taproom at Uptown Plaza is open seven days a week, now serving lunch beginning at 11 a.m., and with Happy Hour from 3 to 6 p.m. Monday-Friday. For more information, call 602-441-4677 or visit www.HussBrewing.com.